This interactive presentation contains the latest oil & gas production data from 80,177 horizontal wells in 10 US states, through September last year. Cumulative oil and gas production from these wells reached 7.6 Gbo and 79.8 Tcf. With several shale basins contributing to growth for the month, September production set a new record for both oil (4.3 million bo/d) and natural gas (37.2 Bcf/d), before revisions. If you deselect the Permian basin (using the ‘Basin’ selection), you can see that overall production in the other basins has been mostly flat since the summer of 2016. 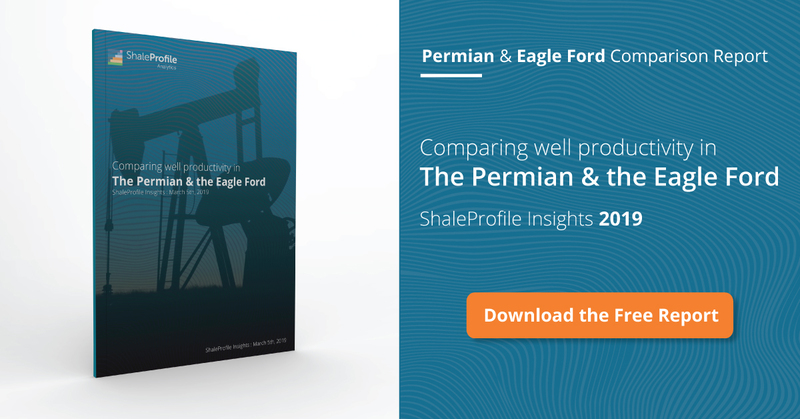 Changing the ‘Show production by’ selection to ‘Formation’ reveals that the Wolfcamp, Middle Bakken, and Eagle Ford formations were responsible for more than half of oil production in September. EOG, which operates more than 10% of this oil production capacity, has been ramping up production since May 2016 (see the ‘Top operators’ dashboard). The improvements in average well productivity in recent years are clearly visible here: the wells that started in 2016 recovered each close to 100 thousand barrels of oil in the first 10 months, while the ones that started in 2013 needed more than 2 years to do this (on average). If you choose a terminal rate, the curves here allow you to make a reasonable guess at their ultimate recovery. In the 4th tab (‘Productivity ranking’), all operators are ranked by their average well performance. This is measured by the average cumulative output in the first 2 years (which you can change) over all their wells. Of the major operators with > 100 horizontal wells, WPX is showing the best results, followed closely by QEP. This is still the case after you remove the gas basins, or change the measurement to cover only the first year of production (12 months). On the Get the Data the latest well and production data is again available, both in Excel, and database formats. I have simplified the purchasing options. Next week I plan to have a new post on the Marcellus (PA), followed by one on North Dakota in the week after. Also, Pierrehumbert’s description about Bakken and EF as one camp of tight oil just shows his ignorance about tight and shale oil. The anti-shale camp already got totally beaten by the wide success of shale gas now. Production data from Marcellus and Haynesville have pretty much proven 80%~90% of their earlier assumptions are wrong. The shale/tight oil production although still far from what shale camp proclaims could do, is on the rise and fare much better than what Pierrehumbert’s described, i.e. 3~10% actual number now versus 1~2% by Pierrehumbert’s in terms of recovery. Shale gas should at least recovers over 35% of the original gas in place if not more. Sure, flaring NG is a carbon and energy wasting practice by oil and gas industry and should be curtailed. But, it is different to translate it as there is not enough oil and gas in the reservoir, and could not be recovered. Krisvis’s comment, and the link he/she posted, implies concern for our hydrocarbon future. I think ‘ha ha’ dismisses that concern, PARTICULARLY on shaleprofile.com, where it is obvious, at least to me, that ONLY in the past 12-18 months has increased productivity of shale oil and shale gas truly come to fruition… but that reported EURS are STILL half of what they should be. With that in mind, and in spite of lower costs, and higher prices, both factions of the shale industry are still woefully unprofitable and unable to pay back the debt that it has gotten itself into. The shale oil industry outspent revenue by at least $30 billion dollars in 2017; including acquisition fees in the Permian Basin, probably more like $42 billion dollars. I have no clue how much the shale gas industry outspent its revenue but I do note that natural gas prices are going down, big time, once this cold weather is over, because of overleveraged oversupply and damn poor planning regarding takeaway capacity. How is that ultimately good, from a business since, for America? Doesn’t America need a healthy, profitable gas industry to supply its needs? Increased productivity of shale oil and shale gas is simply an exponential increase in the rate of depletion of America’s last remaining hydrocarbon reserves. There has been no magical increase in recovery rates of OIP or GIP thru longer laterals and bigger frac’s. That implies that shale resource plays are similar to, for instance, other historical reservoirs in the world’s producing basins; they are absolutely not. In the Permian, because of overleveraged oversupply and lack of takeaway capacity, flaring is growing. In the App Basin, for the same reasons, more DUCs exist and more completed wells are shut in. Flaring associated gas from oil wells and the existence of DUC’s and shut in gas wells is an indication of how out of control and fiscally irresponsible the shale industry actually is. People do really dumb things when they do it with other people’s money. That is ultimate NOT good for America, whatever “camp” you might be in. haha, at least from Shaleprofile.com here, Bakken’s production data is quite different to David Hughes predicted in 2012. His prediction that it takes 2000 wells per year to reach peak of 1.2MM BO is close to correct; but after that it is obviously off, and now it takes just 1000 wells per year to achieve the flat 1.2MM BO. The AGU meeting is just the enemy camp for oil and gas geologists, e.g. AAPG. It is not a nuance mistake to confuse general audience that AGU might have geologists from oil and gas industry to have their voice shared or heard there. The difference between the two, AGU and AAPG, is much larger than Republicans and Democrats. first of all, thank you for maintaining this amazing source of information. I have a data question – I was looking at EOG, as suggested in your notes, but not through top operators tab, but by just selecting EOG as only Operator in the Total Production tab. What jumps right out at you is a a significant increase in production in Sep 17 for all wells, regardless of year of first flow – but most pronounced for 2016. That’s highly unusual behaviour for shale wells. The 468 EOG wells with year of first flow 2016 went from 76,560 bo/d in August to 100,883 bo/s in September. I first thought August production might just have been negatively impacted by the hurricane back then, but July production for the same wells was 85,638 bo/d. So how do we get a 17.7% increase from July to Sep on wells that should be rapidly depleting? I indeed see what you mean. Unfortunately in Texas there can be a disconnect between the production data (reported by lease), and the data for wells on these leases. I suspect that in this case production from new EOG wells was already reported on certain leases, but that basic data about these new wells was still missing. In such a case, the allocation algorithm incorrectly assigns the lease production over all existing wells, which can cause such a jump in legacy production. As far as I am aware, there is no good way to deal with such an issue. I have not verified this hypothesis, but will do so next week, with the latest RRC data. My recommendation is to be careful with concluding anything from these kind of observations.